The Aristocratic understanding (System A) of “בין חערבים (byn ha-arabim)” was represented by the Jews called Sadducees, the Boethusian Sad­ducees, and by the ancient Samaritans. These antagonists, and records which are derived from the later variations of this view (as demonstrated by the neo-Samaritans and Karaites),3 show that, contrary to the Hasidic views, the Aristocratic approach understood that the first ערב (arab; intermixing of light and dark) occurred at sunset and the second at deep twilight (the setting of darkness). The Talmud explains בין שמשיא (byn shamashia) to mean the time between sunset and the stars becoming visible,7 i.e., the twilight after sunset. Since their point of view held that the period of byn ha-arabim was between sunset and dark, we have our first indication that the Sadducees and others of the Aristocratic school originally preferred to sacrifice their Passover victim at the beginning of the day, just after sunset, during the twilight of the 14th of Nisan. The Aristocratic view is also demonstrable in the instruction of Exodus, 12:6-8, which ordered the Israelites to eat the lamb “this night,” immediately after its sacrifice. Since byn ha-arabim was followed by night, the early Sadducees, Samaritans, and others of like mind held to the view that one should eat their Passover supper on the night of the 14th rather than on the night of 15th, as the Hasidic Pharisees and others were accustomed. How long other Jewish groups who practiced the Aristocratic method held out in their belief is unknown. Yet, it is certain that nearly all of the Jews living in Judaea, with the exception of the early assemblies following Yahushua the messiah,14 fell beneath the iron hand of the Pharisees prior to the end of the first century C.E., which certainly would have influenced their subsequent decisions. Sadducee Power Gone After 70 C.E. The neo-Samaritans and Karaites, who observed a modified form of the Aristocratic view (System C), have remained to our present time but, for all intents and purposes, they too have ceased as a religious force. Originally, the assemblies following Yahushua the messiah also observed the Aristocratic system. Yet as time passed they suffered through a period of radical change with regard to the Passover festival, a transformation which began in the first half of the second century C.E. We shall discuss this transformation in our subsequent posts. Those adhering to the original Aristocratic reckoning for Passover (System A) saw the issues quite differently from the Hasidim (System B). Further, they followed the statements in Exodus, 12:18-19 and Ezekiel, 45:21, indicating that the 14th of Abib (Nisan) was the first day of the seven days of eating unleavened bread. The expression, “In the first (moon) on the 14th day of the moon within arab you shall eat unleavened bread until the 21st day of the moon within arab,”18 was understood as inclusive of the 14th day and exclusive of the 21st day. Accordingly, the seven days lasted only “until” arab (twilight)—i.e., to the beginning of the 21st day. For the Hasidic interpretation the statements found in Leviticus, 23:5-8 and Numbers, 28:16-25, where the 14th was the Passover and the 15th was called a Khag of Unleavened Bread for Yahweh, are pivotal points for their case. • To begin with, for the advocates of the original Aristocratic system, per scriptural command,19 there are only seven days of Unleavened Bread—not seven and one-fourth days (eight days) as produced in the Hasidic system. Since the 14th was a day of Unleavened Bread,20 they counted these seven days from the beginning of the 14th until the end of the 20th day (beginning of the 21st day) of the first moon. • Second, when the festival is referred to in Scriptures as the Festival of Unleavened Bread, without reference to the Passover, it has seven days.21 And, when the festival is referred to only as the Festival of Passover, with no reference to it as the Khag of Unleavened Bread, it still has only seven days.22 Therefore, Passover and Unleavened Bread are two names for one-and-the-same seven-day festival period! 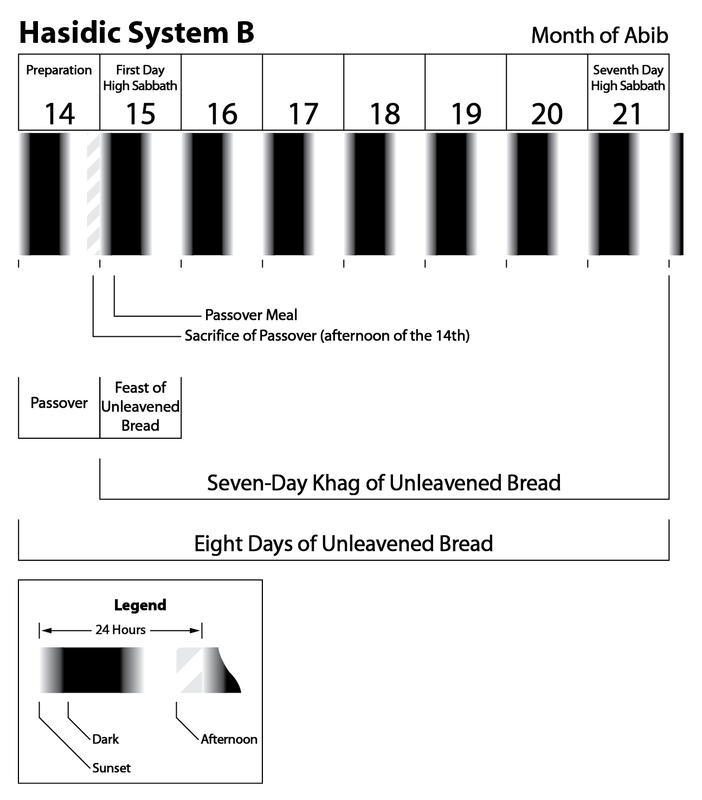 • Third, the entire seven-day festival was originally named the Khag of Unleavened Bread.23 Therefore, each day is a khag, not just the first day. At the time of the Exodus, the first day of the seven-day Khag of Unleavened Bread, which is a sabbathon, was renamed the Khag of Passover. That left six more khag-days from the original description. 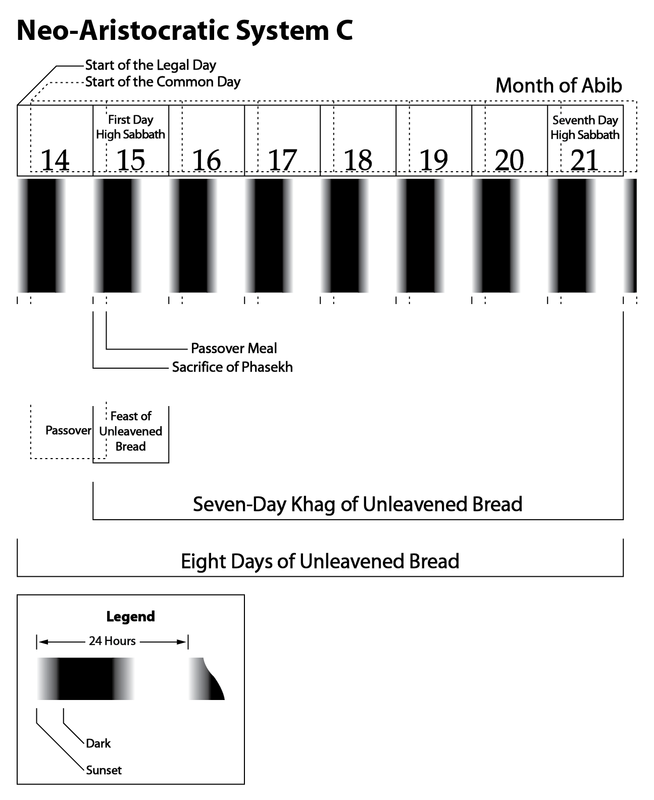 These remaining six days formed the Khag of Unleavened Bread and began on the 15th of Abib. This construct is explained by the six days of eating unleavened bread found in Deuteronomy, 16:8. For those holding to the original Aristocratic view, that is all that Leviticus, 23:5-8 and Numbers, 28:16-25, are saying. What then of the issue of Leviticus, 23:32, with reference to the Day of Atonement on the 10th day of the seventh moon? As we have shown, the advocates of the Hasidic view argue that the phrase בתשעה לחדש בערב (be-teshuah la-khodesh be-arab) means “in the ninth (day) of the moon at arab,” and that this proves that there is a period of arab at the end of the ninth day. Those adhering to the Aristocratic view, meanwhile, see this translation as an error, invented by the Hasidim in an effort to create support for their interpretation. In the eyes of those advocating the Aristocratic system, this verse does not even mention the ninth. That is, one is delivered from his sins when he renews himself by making atonement, symbolized by fasting. This fasting starts at arab, at the beginning of the 10th day. At present we have very few extra-biblical sources demonstrating exactly how the Festival of Passover and Unleavened Bread was observed prior to the outbreak of the Hasmonaean (Maccabean) Revolt (late 167 B.C.E.). Nevertheless, the text is so defective that we are unable to decipher its precise meaning. If “until the 21st” is by exclusive dating, it would refer to the Aristocratic system; yet if that phrase is inclusive, it would reflect the Hasidic method. There is simply no clear way of knowing. Fortunately, we do have at least one solid reference to the practice of the Jewish priests in the pre-Hasmonaean period and it demonstrates the Aristocratic view (System A). While noting that the Festival of Unleavened Bread continued from the beginning of the 14th until the end of the 20th (as opposed to the Hasidic idea that it began with the 15th and ended at the end of the 21st),37 Anatolius cites Aristobulus of Paneas as one of his chief proofs. We will continue our discussion of the Aristocratic practice with the viewpoint of the ancient Samaritans in our next post titled 15. Passover – Aristocratic Practice II. 1 The system used by the early assemblies following Yahushua the messiah will be discussed in the forthcoming post dealing with the Quartodecimans. 2 CBTEL 9, p. 235. 3 The neo-Aristocratic view will be addressed in a forthcoming post. 4 GHCL p. 652, s.v. br[. 5 ADB 3, p. 691. 6 Targ. Onq. Exod. 12:6, 16:12, 29:39, 30:8; Lev. 23:5; Num. 9:3, 5, 11, 28:4, 8. 7 E.g., B. Shab. 34a–b; cf., B. Ber. 2a–b. Also see S. R. Driver’s comments (BE, p. 89). 8 EJ 8, p. 1166. 9 Abraham, Com. Exod. 12:6. 10 Par. 3:3, 7; B. Hag. 23a; B. Par. 34b, 36b; B. Yom. 1:19b. 11 Par. 3:7; cf. B. Yom. 1:1a. 12 The Sadducees controlled the celebration of Passover until Archelaus was removed as king of Judaea in 6 C.E. and an aristocratic government of priests was set up in mid-7 C.E. Yahushua was 12 years old in the spring of 7 C.E. and is said to have gone with his parents to Jerusalem at that time to celebrate Passover (Luke 2:41-42). Since the messiah never sinned, and since he observed the Passover supper on Abib 14, it stands to reason that his parents, to whom he was subject, did likewise. 14 The Aristocratic practice continued strong among many Christian groups until the third century C.E. It began to be heavily suppressed after the Council of Nicaea in 325 C.E. but lingered on in more remote regions until the seventh century C.E. 15 NBD p. 1124; MDB, p. 785. 16 The Talmud mentions a Boethusian in a dispute with one of the pupils of Rabbi Akiba during the first half of the second century C.E. (Shab. 108a; Sof. 1:2). 19 Exod. 12:15-20, 13:6-7, 34:18; Lev. 23:5-8; Num. 28:16-18; Deut. 16:3. 20 Exod. 12:18; Ezek. 45:21; cf., Num. 9:11-12. 23 The evidence shows that the Passover, as a commanded sacrifice, was not originally part of the seven-day festival. It was originally intended only as a one-time event in Egypt meant for the Exodus. To demonstrate, there were no commanded sacrifices after the Israelites left Egypt (Jer. 7:21-26). As a result, in the covenant at Mount Sinai, only the statute to keep “the Khag of Unleavened Bread” was affirmed, with no reference to any Passover sacrifice (Exod. 23:14-17). The Passover sacrifice was reintroduced only after the Israelites rebelled by building the golden calf at Mount Sinai. With this act of idolatry, the Israelites had broken their marriage covenant with Yahweh. To reinstate them into this covenant, Yahweh commanded that a Passover victim be sacrificed each year with the unleavened bread (Exod. 34:25). 24 In Hebrew, בתשעה (be-teshuah) means, ב (be) = “in, among, with” (HEL, p. 30), and תשעה (teshuah) = “rescue . . . deliverance, help, safety, salvation, victory” (SEC, Heb. #8668), “freedom, safety, salvation, deliverance” (HEL, p. 262). The word לחדש (la-khadash; for renewing) means, ל (la) = “to, towards . . . at, in . . . till, until . . . in order to, for the purpose of . . . for, belonging to, with respect to” (HEL, p. 131), and חדש (khadash) = “a prim. root; to be new; caus. to rebuild:—renew, repair . . . new:—fresh” (SEC, Heb. #2318–2319), “renew, restore” (HEL, p. 80). 25 Cf., comments in THP p. 8, ns. 2, 8. 26 ESE 2, pp. 1903–1907; RES no. 1792; PSBA 33, facing p. 184; THP p. 8. 27 APOJ tafel 6; THP pp. 9f. 28 APOJ tafel 6, lines 4–5. 29 APOJ tafel 6, line 8. 30 The relevant quotation from the Canons of Anatolius on the Passover is found in Eusebius, H.E. 32:14–19. 31 Jerome Lives, 58; Eusebius H.E., 7:32; ANF 6, p. 145; OTP 2, p. 837, n. a. 32 OTP 2, p. 837, n. a. Also see below n. 37. 33 The connection with Paneas is found in the Latin and Syriac text (OTP 2, p. 837, n. c). This “Aristobulus the famous” (i.e., Aristobulus of Paneas) must not be confounded, as is often the case (as done in HJP 3, pp. 579-586; JE 2, p. 97f; EJ 3, pp. 443f; and so forth), with the philosopher named “Aristobulus of Alexandria,” also called “Aristobulus the Peripatetic,” who flourished in the time of Ptolemy Philometor (181-145 B.C.E.) (Eusebius, P.E. 9:6). The fragments from both are found in Eusebius H.E., 7:32:16-18, P.E. 8:9:38-8:10:17, 13:12:1f, 9-16, 13:13:3-8, 34; Clement, Strom. 1:148:1, 1:150:1-3, 5:99:3, 5:107:2, 6:32:3–33:1, 6:137-144. An English translation of these is provided in OTP 2, pp. 837-842. All problems disappear once it is realized that we are speaking of two different men named Aristobulus (a common name used by the Jews during the Seleucid period). Anatolius spoke only of the man who assisted in the translation of the Torah into Greek. As for the claim that the name Aristobulus does not appear in Aristeas’ list of the 72 translators (Aristeas 47-51), any such objection fails on three counts. First, Jewish priests of this period often carried more than one name—e.g., Jonathan Johanan (379–348 B.C.E. ); Joshua Jason (180-178 B.C.E. ); Onias Menelaus (177-162 B.C.E.). Second, the list at question claims 72 names but only 71 remain (one name clearly being erased). The name missing is the sixth name of the fourth tribe (OTP 2, p. 16, n. k). That someone begrudged Aristobulus of Paneas his place in this list might well serve as a reason to erase his name. Third, the fourth name of the tenth tribe is Baneas, which seems nothing less than Paneas, which easily could represent Aristobulus of Paneas. Any one of these reasons would explain why the name of Aristobulus does not presently appear. 34 Pliny 7:16 §74; Eusebius, H.E. 7:17; Jos. Wars, 2:9:1, Antiq. 18:2:1. Also see DGRG 2, p. 540; NBD p. 175; DB p. 100. 37 Anatolius went to great lengths to define what he meant by the “seven days of unleavened bread.” He explains that the 14th day was the first day of Unleavened Bread and the day in which the messiah ate the Passover. He then demonstrates that if one counts “from the end of the 13th day of the moon, which marks the beginning of the 14th, on to the end of the 20th, at which the 21st day also begins, and you will have only seven days of unleavened bread, in which, by the guidance of the sovereign, it has been determined before that the most true Festival of the Passover ought to be celebrated,” and that these seven days do not go “beyond the limit of the moon’s 20th day” (Anatolius 8, 11). 39 For μεθ’ (meth), a form of μετά (meta), “within,” i.e., “in the midst of, among, between . . . of motion, into the middle of, coming into or among” (GEL 1968, pp. 1108f). For ἑσπέραν (hesperan) see 13. Passover – Hasidic Practice II, n. 9. 40 The Aristocratic understanding of these seven days will be discussed in our forthcoming posts dealing with the seven days of the Quartodecimans and Quasi-Quartodecimans. This entry was posted on 01/20/2013, 7:40 pm and is filed under Calendar, Feast Days, Passover, Religion, Unleavened Bread, Yahshua, Yahushua, Yahweh. You can follow any responses to this entry through RSS 2.0. You can leave a response, or trackback from your own site.